Secretary of Commerce Wilbur Ross straightens his papers during a Senate Finance Committee hearing on tariffs, on Capitol Hill, June 20, 2018 in Washington. Testifying before a Senate panel, U.S. Commerce Secretary Wilbur Ross on Wednesday withstood a bipartisan barrage of complaints and criticism over the Trump administration’s escalating trade battles with China and key American allies. Senators responded with incredulity and, at times, sarcasm to the commerce secretary’s defense of new tariffs announced or contemplated on imports ranging from steel to automobiles. 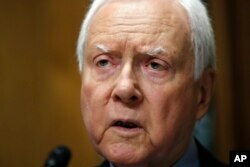 Chair of the Senate Finance Committee Sen. Orrin Hatch, R-Utah, speaks during a committee hearing on tariffs with testimony from Secretary of Commerce Wilbur Ross, on Capitol Hill, June 20, 2018 in Washington. “It sounds to me like we got a government-run mercantilist economy, as opposed to a free-market economy,” Iowa Republican Sen. Chuck Grassley said. Ross announced that more than 20,000 U.S. entities have asked the administration for waivers, allowing them to import steel goods tariff-free, of which 42 had been approved so far. He admitted that steel prices have risen in the United States, harming some domestic industries. But he said tariffs are not primarily to blame. “There has been a lot of speculative activity — storing inventory, withholding product from the market,” the commerce secretary said, adding that the administration is investigating “whether there are people who illegitimately are profiteering” from tariffs. Sen. Michael Bennet D- Colo., speaks speaks to supporters at a campaign stop for President Barack Obama in Grand Junction Colo., Aug. 8, 2012. 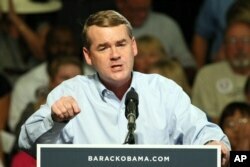 Colorado Democratic Sen. Michael Bennet countered that tariffs must be to blame for rising costs, since the punitive measures enabled any profiteering taking place. Bennet also expressed consternation over U.S. tariffs on Canadian steel after Ross admitted that the United States does not, in fact, have a trade deficit with Canada on the product. “What is the national security rationale for putting a tariff on the Canadian steel industry with whom we have a trade surplus?” the Colorado senator asked. Ross replied that the United States has to respond to steel dumping on a global basis because China “masks” the true volume of steel exports to the United States by shipping products through other countries, including Canada. “If you just believed the raw numbers, China is shipping less to us than they did five years ago. The reality is quite to the contrary,” the commerce secretary said. 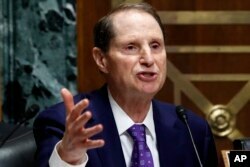 Oregon Democratic Sen. Ron Wyden said he applauds President Donald Trump’s determination to vigorously enforce U.S. trade laws, crack down on China’s trade practices, and update the North American Free Trade Agreement, NAFTA, between the United States, Canada, and Mexico. But Wyden criticized the administration’s performance in pursuit of those goals. Ross told senators he backs Trump’s decision to act boldly on trade. Sen. Patrick Toomey, R-Penn., listens to Secretary of Commerce Wilbur Ross during a Senate Finance Committee hearing on tariffs, June 20, 2018, in Washington. 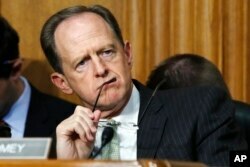 Republican Sen. Pat Toomey of Pennsylvania bemoaned a heavy-handed approach to trade. Toomey is backing a proposal by a fellow Republican, Tennessee Sen. Bob Corker, that would require congressional approval for tariffs levied for national security reasons. The Senate declined to vote on the bill last week, but Corker and other backers have vowed to continue fighting for the measure.